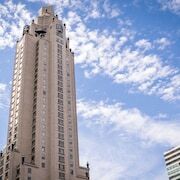 With a stay at this apartment in New York (Upper East Side), you'll be minutes from Bloomingdale's and Barney's. This property is close to Rockefeller Center and Chrysler Building. Make yourself at home in one of the air-conditioned rooms featuring kitchens with refrigerators and microwaves. Complimentary wireless Internet access is available to keep you connected. Conveniences include coffee/tea makers, and both cribs/infant beds (surcharge) and rollaway/extra beds (surcharge) are available on request.